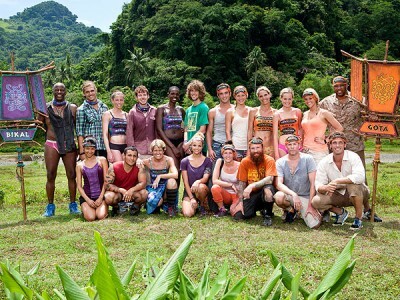 Can “favorite” Survivor players from the past help bring back big ratings to this venerable reality series? Could CBS cut the Jeff Probst series back to air just one cycle per season? We’ll have to wait and see. Below are the TV show’s ratings for the Spring 2012-13 season, the best way to tell if Survivor will be renewed for another cycle. Survivor airs on Wednesday nights on CBS. There are usually 15 or 16 episodes per season. Final season averages: 2.6 rating in the 18-49 demographic with 9.47 million total viewers. 2.2 in the demo (-19% change) with 8.13 million (-20% change). Season averages: 2.56 in the demo with 9.47 million. 2.7 in the demo (+4% change) with 10.16 million (+7% change). Season averages: 2.59 in the demo with 9.57 million. 2.6 in the demo (+8% change) with 9.51 million (+3% change). Season averages: 2.58 in the demo with 9.52 million. 2.4 in the demo (-17% change) with 9.25 million (-10% change). Season averages: 2.58 in the demo with 9.53 million. 2.9 in the demo (+7% change) with 10.31 million (+3% change). Season averages: 2.59 in the demo with 9.55 million. 2.7 in the demo (+4% change) with 9.99 million (+7% change). 2.6 in the demo (+4% change) with 9.38 million (+1% change). Season averages: 2.54 in the demo with 9.42 million. 2.5 in the demo (0% change) with 9.25 million (-2% change). 2.5 in the demo (-4% change) with 9.43 million (-4% change). Season averages: 2.54 in the demo with 9.45 million. UPDATE: Survivor has been renewed for a 27th season by CBS. 2.6 in the demo (-4% change) with 9.79 million (-1% change). Season averages: 2.55 in the demo with 9.45 million. 2.7 in the demo (+4% change) with 9.89 million (+3% change). Season averages: 2.54 in the demo with 9.38 million. 2.6 in the demo (0% change) with 9.58 million (+5% change). Season averages: 2.50 in the demo with 9.25 million. 2.6 in the demo (+8% change) with 9.17 million (-2% change). Season averages: 2.47 in the demo with 9.14 million. 2.4 in the demo (0% change) with 9.32 million (+4% change). Season averages: 2.40 in the demo with 9.13 million. 2.4 rating in the 18-49 demographic with 8.94 million total viewers. Season averages: 2.40 in the demo with 8.94 million. Historically, this was the lowest-rated season premiere for Survivor. Year-to-year, the series was down by 23% in the demo (vs a 3.1 rating) and down by 17% in viewership (vs 10.79 million). Reference point: The Spring 2011-12 season averaged a 2.8 rating in the 18-49 demographic with 10.07 million total viewers. great show, there is no way CBS will cancel it! Survivor typically does better than some scripted shows do. If that keeps up, I see no reason why there wouldn’t be a 27th and 28th season. Besides, they are casting for future seasons so that’s a good sign. Always great when a new season of “Survivor” kicks off!! I hope CBS renews it! Traditionally, the show has gotten picked up for early renewal, so I’m a little worried that it’s still up for grabs! Love the show. I look forward to every season. I hope it is not cancelled. SURVIVOR – LOVE IT, LOVE IT, LOVE IT – AND I AM IN THE GRAY NOMAD VINTAGE.